The name of the house is a combination of our village name (Kallivari) and our cultivation of goji berry, at the entrance of a 4 acres lush property.` Kalliberry is an old Cycladic farmhouse, recently fully renovated, keeping all those elements that highlight its traditional character. Thick stone walls maintain a constant temperature in the house, keeping it always cool. Ideal for couples who are looking for a special place to enjoy a romantic weekend or their summer holidays, and for a group of 3 or 4 people looking for a unique experience. You can enjoy the house and wander on the surroundings, relax in the outdoor sofa , lie down on the sunbeds or the large hammock and feel the wind from the north, put your ideal destination to our handmade totem and travel around the world with your imagination to all the places that our guests have marked, pick up fresh vegetables from our small garden for your salad, watch a movie in the outdoor home cinema at the veranda, or simply take a drink in the magnificent sunset and enjoy the breathtaking view. This summer all our guests will have the opportunity to enjoy our new swimming pool! If you need calm vacations, explore the nature of North Andros, discover the wild beauty of Zorgos, Fellos and Kourtali beach, dive from the tallest rock to the sea at Vitali beach, fish with a stick from the shore at Peza beach, or wander through the mapped paths of the island. On the other hand, if you are seeking for fun vacations, you can visit Chryssi Ammos, Agios Petros or Kypri beach, near Gavrio port, where beach bars and water sport activities are located. Visit the noble capital of the island, Chora, wander through its picturesque alleys and museums, eat some delicious deserts and sweets in Gavrio port, or explore the night life of Batsi. We are 3 friends, 3 travelers of the world, Dimos, Katerina and Thanos, who decided to leave the big city and start a new life in this beautiful Cycladic island. This house was fully renovated with positive energy, a lot of personal work, hours of designing, but most of all with great love for all the happy travelers of the world who are going to visit our house. Dimos has a company that organizes events, Katerina and Thanos have a commercial company. We are all people who love to travel, to have guests in our house, to laugh, to enjoy life, to cease the day. We speak English, French, Italian and Spanish. Dimos father grew up in this Cycladic house and Dimos used to holiday here as a child. Katerina and Thanos visited Dimos house some years ago, they felt in love with the place and decided all together to renovate the old stable and transform it into a beautiful traditional house. Lots of infinity view spaces and cozy spots to chill out. Sofa, sun beds, hammock, swing and a big pool deck waiting to be explored. Flower gardens, vegetable gardens and many trees combine the scenery. The house is like a cave, with thick stone walls that keep a constant temperature in the house, keeping it always cool. It is very atmospheric, with vintage lamps, but also pop details. The house is full of color, we have a small garden with flowers and vegetables, as well as a small cultivation of goji berry. The sunset is breathtaking, the view at Kafireas sea passage is magnificent! This summer all our guests will have the opportunity to enjoy our new swimming pool! The bathroom is a combination of Cycladic and Moroccan style, where our guests can enjoy their bath in the vast bathtub with the magnificent view and the Cycladic sun. A traditional kitchen, fully equipped, with a small fridge, sink and oven. Dishes, glasses, coffee cups, set of cutlery, pots, kettle and toaster are provided. Stunning! One of our best holidays ever. We absolutely loved our stay at Kallibery. Our hosts, Dimos, Katerina and Thanos could not have been kinder or more helpful. And even better we had a practical demonstration on making honey, with a tasting too! Where else could you have such an interesting stay! The house is as perfect as the photos suggest. The inside and outside are so well designed and charmingly decorated. There is so much space for lounging and looking at the spectacular view - the sunsets are marvellous. And the pool is brilliant, we spent many happy times going for a cooling dip before chilling out again on the hammock or the sofas. The amount of shade offered is also fantastic - both of us like to be in the shade during the hottest part of the day and the design of the outside made it easy and pleasant to get out of the sun - shady but not gloomy. Another plus is the peace and quiet - virtually no traffic of any sort goes past. What we really needed was rest, and this is exactly what we got! The house is also well located for local beaches and shopping and restaurants in Gavrio and Batsi. We chose Kalliberry to celebrate my birthday and our wedding anniversary, and we couldn't have made a better choice! Kalliberry is truly a magical place, even more amazing than on the pictures! Ideally located on the island when seeking resourceful holidays away from crowded tourism, yet close enough to the very cute Gavrio port. The house is very comfortable and so tastefully decorated : Everything is delicately thought and nice. The outside terrace, garden and pool are literally enchanting, offering breathtaking views, specially on the sunset, magnificent! Thank you so so much Katerina & Dimos for sharing your peaceful spirit. For sure, we will come back some day! What can we say about this place? Magical, wimsy, hobbit hole, fresh air, good people, fresh garden, and beautiful all wrapped into one place, that’s Kalliberry. We planned a lot of our trip to Greece around this place and we weren’t disappointed. In summary, we loved our time at Kalliberry. Coming from Colorado we felt right at home. We made some new friends and great memories. We will be back. Magical retreat off the beaten path that is super easy to fall in love with in an instant. 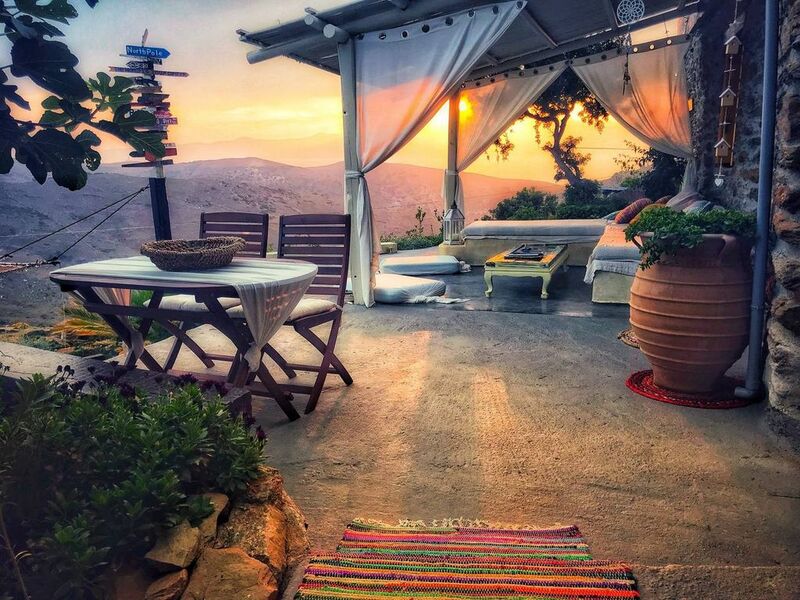 The views are mesmerising, the fresh air is divine, and the hosts are so very helpful and have created a stunning place full of unique charm. Used herbs from the garden, enjoyed yoga on the deck, sipped coffee on the day bed under the pergola in the cool morning breeze, soaked up some sun while floating in the cute little pool, giggled at all the goats had to say in the beautiful valley below, and loved the time getting to know Dimos, Thanos, Haris, and Katharina. They are all fantastic hosts! We had a relaxed, comfortable and very romantic stay in a renovated traditional house in a small mountain village . The location is perfect for those who seek the retrieve from urbanization and flows of tourists. There are very nice beaches within few kilometers from the village and some good tavernas with perfect local food. The owners are very friendly and helpful. We enjoyed the Kalliberry very much, thank you , dear Katherina and Dimos! A very polite couple that followed all the rules of the house, very clean, very thoughtful. They caused no problems at all, they were very helpful with everything. We recommend them as guests in any house! Thank you both! Un petit coin de paradis tenu par trois anges Dimos, Katerina et Thanos qui ont répondus, avec une grande disponibilité et tellement de gentillesse, à tous nos désirs et tous nos besoins (les plus belles plages, les restaurants, les conseilles pratiques...). Nous avons été reçu comme des princes, la maison a beaucoup de charme et de cachet, décorée avec goût et bien équipée. Allongés comme des pachas sur les coussins de la terrasse, nous avons profité du calme et d'une vue splendide sur la mer et la campagne. Nous avons même dégusté les légumes bios du jardin. Si vous cherchez la paix et le bonheur, vous les trouverez à Kalliberry chez katerina, Thanos et Dimos, un endroit où il fait bon revenir. Merci encore à nos hôtes pour ce séjour innoubliable. Jeff et Sophie etaient les parfaits invites! Si gentils et chaleureux, ont traite notre maison comme si c' etait la leur. Ils etaient toujours avec le sourire, pleins d'enthousiasme et de pensee positive, c'est incroyable! Nous n' ουblierons jamais nos discussions, nos blagues, ou la nuit que nous sommes passes en mangeant a la terrace de la maison. Jeff et Sophie nous souhaitons que vous soyez toujours si souriants et optimistes, differents de tous les autres, et pour cela si speciales!